OLDRIGHTIE: Queen's Guest List To Embrace All But The Deserving. Queen's Guest List To Embrace All But The Deserving. Roll up, roll up and use the Alzheimers to justify such treacherous forgetfulness. I suppose the gloves prevented any of the blood stained corpses and the grief of relatives murdered, nay butchered by this piece of unmitigated scum of the earth, from actual flesh on creepy flesh. Minister and murderer rolled into one glorious trougher at the State purse he did so much to bring down. If ever hypocrisy showed its ugly side, this is it on the part of both parties. Where next? Well, Boy Dave, here's a beauty of "reconciliation and forgiveness" for you. What an opportunity to surpass even this shameful excrement rubbing our noses in minority superior acceptance. I give you a close brother in murderous arms to the great and wonderful Paddy Marty, a man named Mick, at that. If I had photo shop skills I would put Adebolajo in that picture above. Mind you Mick needs to get a wriggle on before our once respected and now compliant geriatric Maj pops off this mortal coil. It really does beggar belief and make one realise how comfortable monarchy is where blood shed might be seen as an opportunity to get ever richer. I can think of no other reason this picture was made possible. 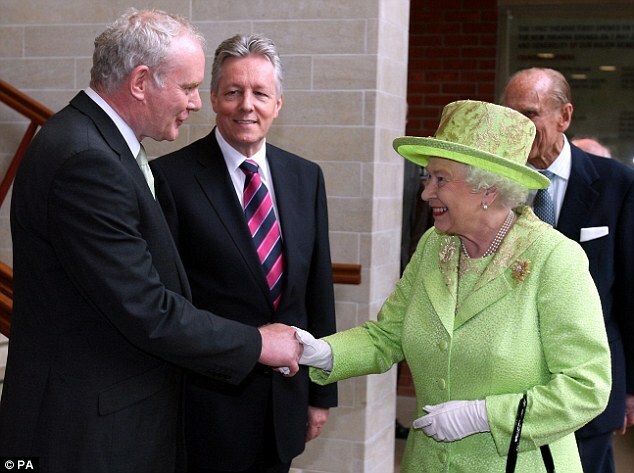 "Smile and shake his hand, your majesty and we'll up your income." Disgusting and so ultra modern. I guess Charlie will be polishing Mugabe's shoes next. 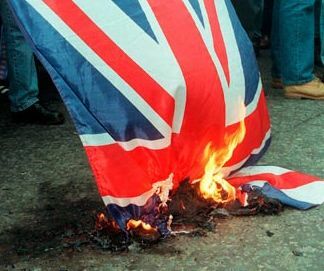 There's me used to be a staunch Royalist as a preference to politicians greedy presence. Now it seems just another glossy facade for the underlying corruption and immoral greed of Western decay. I hope the sod neglected to wash his arse, hopefully wiped the smile from their smug bloody faces when they bent down to kiss his ring. The whole lot of'em make me puke with their plastic smiles, not a bloody principle to be found anywhere.